Project digital images onto your canvas or drawing surface to trace out. Wake up your audience as you brighten photographs and artwork. Artograph has run out of Inspire 1000 art projectors. The new version�Inspire HD should be ready about mid-June. Any orders in house for the current model will be covered. A Digital version of the old Opaque projectors! Project and enlarge digital photos, .jpegs, .gifs, PDFs and the like, onto a wall, a canvas on an easel or down onto a drawing table to trace out the projection and create your art from there! You can even project onto the back of your canvas and the projection will be strong enough to show through to the front of your canvas, so you won't get in the way or throw any shadows between the projection and your work surface! For Horizontal projecting, it cames with a simple tripod mount to attach to any standard camera tripod. ARTOGRAPH's line of digital art projectors are best-sellers and really loved by our customers! Made for regular projection viewing too! Power up your photos and slides with the ARTOGRAPH Inspire1000 digital art projector. Now with 1000 lumens of bright light and sharper contrast. The Inspire1000 adds another great feature; wireless screen-sharing versatility for Android and Windows operating systems. Preset your images and review each step of art creation. The easy-to-use Artograph Inspire1000 Art Projector is customizable for your specific needs. Create drawings and paintings and then simply access your artwork -- see what is being processed! It is definitely time to upgrade from the old-style plastic sheets in the outdated, obsolete manual projector. This digitally-enhanced overhead Art Projector allows you to dump those old plastic or metal physical slides. Instead, you can quickly and easily access media from a number of data storage sources. The Artograph Inspire1000 Art Projector is a breeze to use but one of the best things about it is that when making a presentation, you do not have to store “hard copy” slides or prints. Important presentations won’t get lost in the shuffle of old-fashioned slide trays. Access your slides, photos and artwork with a touch of the finger -- the information is ready when you need it. With the Artograph Inspire1000, you are able to create square images from angled surfaces; the unit works in areas that not would not sustain a traditional manual slide projector. Another great feature is that nearby obstacles -- your body, for example -- will not be in the audience’s viewing range. This Digital Art Projector provides the exact settings needed to preview your work’s tonality, gray-scale, low or high contrast and detail. This light-weight projector -- just over a pound -- uses maintenance-free 1,000 lumens LED, 30,000 hour lamps. Image and color controls for the Inspire1000 include color, black and white, image rotation, flip and reverse, correction, temperature and edge adjustment, and dynamic contrast. Mount the unit on a tripod, plug it in to your computer (using RGB, USB or HDMI components), grab the fully-functioning remote control and turn out the lights! Projects at a range of about 25 to 100 inches. With 22 grids and bonus “on-board” geometric patterns and shapes, you can add edging and backgrounds to your presentations -- bring your artwork forward! Compatible with smart phones, iPhones, iPads and other tablets. The projector size is 5.5 x 5.5 x 2 inches. The package includes the remote, battery, multi-voltage A/C adapter (100-240 V, 50/60 Hz),multi-card USB card reader and storage bag. Bring your presentations to life with the latest technology. 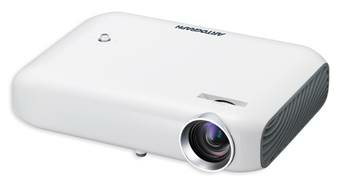 Order the ARTOGRAPH Inspire1000 Art Projector for your presentation needs today. Offers an enormous upgrade from traditional manual projectors that use clear plastic sheets. In addition to eliminating physical slides, the unit only weighs one pound. This digital overhead projector displays media from almost any type of data storage. The unit is also compatible with many smart devices such as smartphones and tablets. With this projector, presenters no longer need to print or store hard-copy overhead slides and are never caught off guard because they have lost or misplaced an important presentation slide. Users can create presentation materials on any capable device and retrieve it easily. A multi-featured remote control lets users change the projector's magnification, color and other traits as well as allowing them to flip through slide show presentations with ease. Features a powerful 1000 lumen LED display that brings presentations to life with high definition clarity. The projector also features the capability to square images to a viewing surface from an offset angle making it easy to set up the projector in locations that were previously unsuitable with traditional units. The focusing feature also allows presenters to situate the projector so it does not block the audience’s line of sight, a capability that creates more viewable audience seating. This feature also makes it easier to set the device up at an angle and use it as a template for artistic projects. Artograph, of course, also designed this for artists. One can project a digital image onto a canvas or wall and trace out the projection to begin their art. Please note however, this a Digital Projector, not an Opaque Projector.